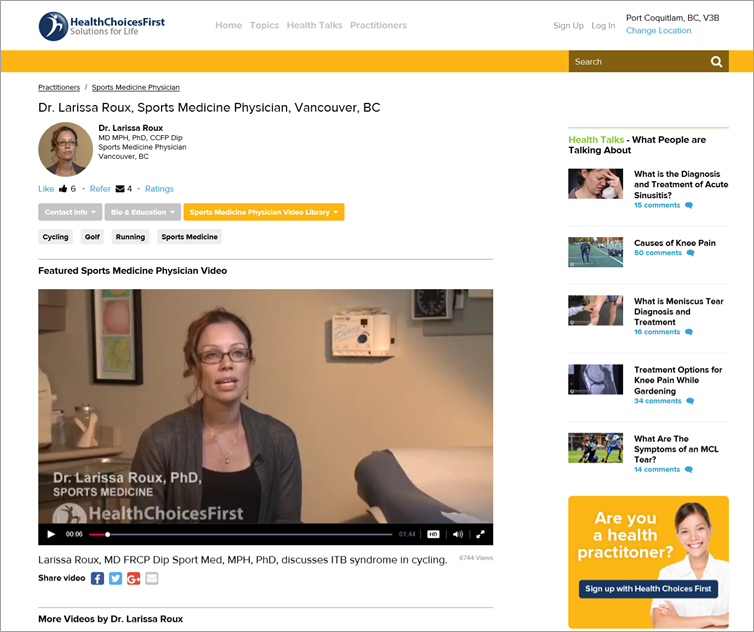 Health Choices First has the largest and most comprehensive offering of online health video in Canada and the widest offering in NA With some 1600 topical videos and four different styles of videos. 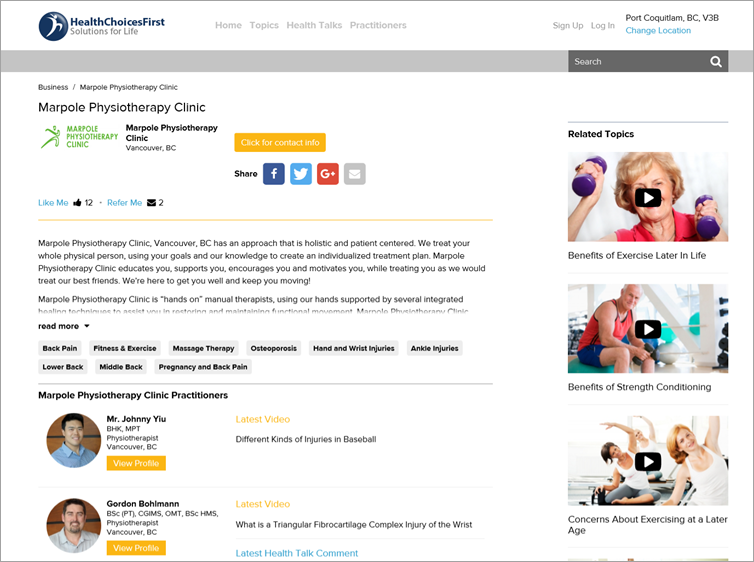 HCF can create multiple kinds of Health and Lifestyle videos for your needs. Let HCF help by creating your own health videos and expand them across your marketing platforms and all of our health platforms. 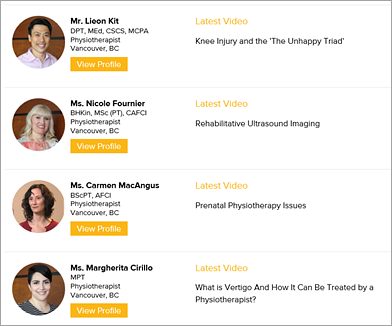 Below are examples of how your videos can be viewed by patients across Canada and the United States. HCF will work with both you and your company on creating engaging videos using a variety of mediums including KOL speakers, animation, filler and a combination of all hree. Videos are typically non scripted and two minutes in length for optimal retention and engagement. Enhance your internet presence by featuring in topical videos focused on your area of expertise. 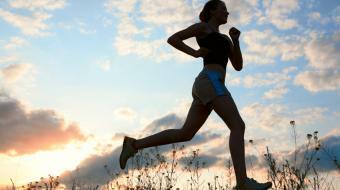 Leg Length Discrepancy - Treloar Physiotherapy, Vancouver BC Debra Treloar, BSR, FCAMPT, Physiotherapist, discusses differences in leg length. Debra Treloar, BSR, FCAMPT, Physiotherapist, discusses differences in leg length. To arrange a meeting with an HCF representative see contact information at the bottom of this page. 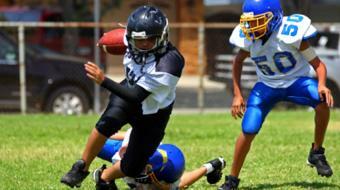 What is IT Band Syndrome and What Are the Treatment Options? 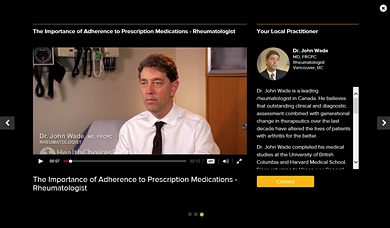 Discover how video can engage patients and set you apart from your competition. 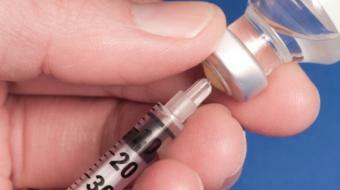 Patient education in health is in huge demand and continues to grow. Be ahead of the curve and create your own topical videos. Display your videos in relevant health topic sections and link them to appropriate health care practitioners for maximum exposure to the market. 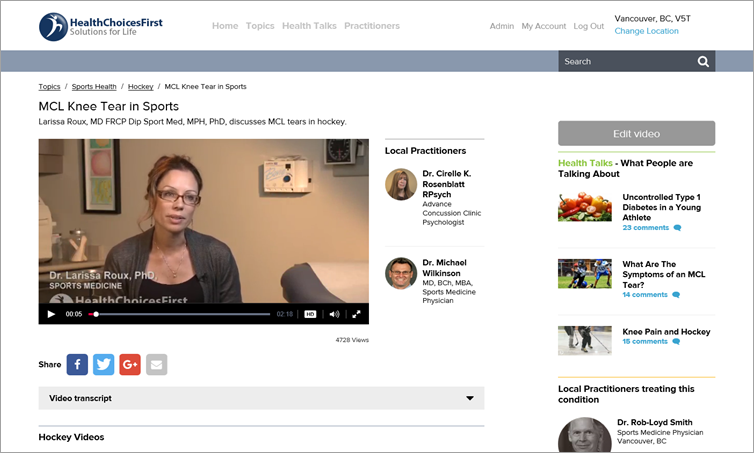 Display your videos on your Practitioner Home Page and highlight what you specialize in. Separate yourself and your business from your competition by creating your own videos on topics you specialize in. Display them on your practitioner page and increase local and international exposure to the market. Enhance your Company Listing with your topical videos. Don’t settle for non-descript internet listings anymore, build your company page and highlight your videos, what your company does and who works there. Company employees will also be listed and linked to their videos. 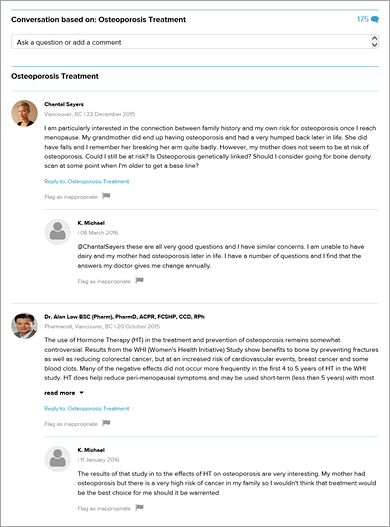 Your videos can be featured in related Health Talks on the site. 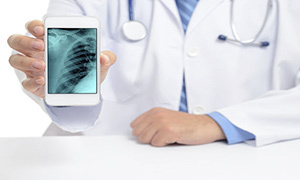 Health Talks are thought provoking and informative platforms that practitioners can contribute to, either through video, authoring the case study, or by blogging. Educational Dashboards are educational video libraries that can be viewed by anyone signed into HCF. 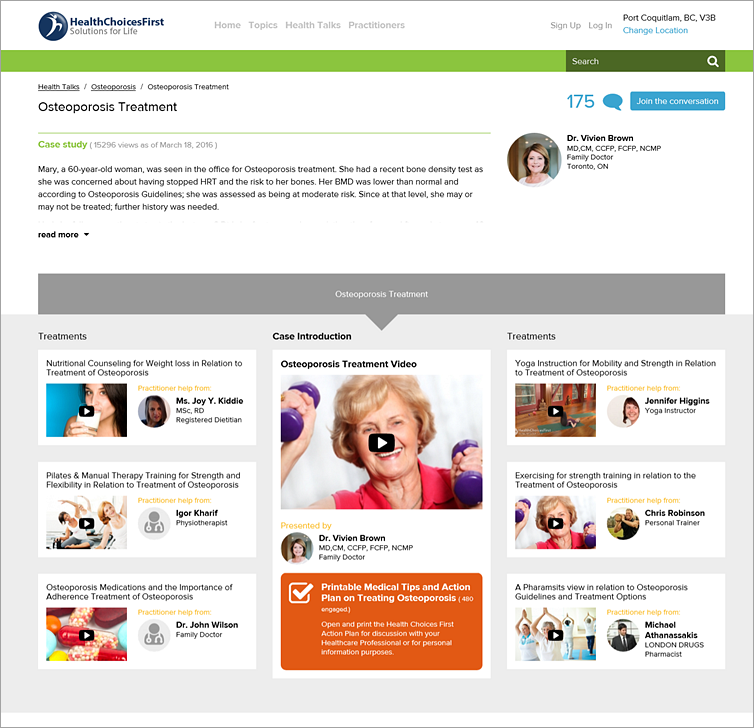 Your videos can be a part of not just yours, but every related practitioners educational dashboard on the site. 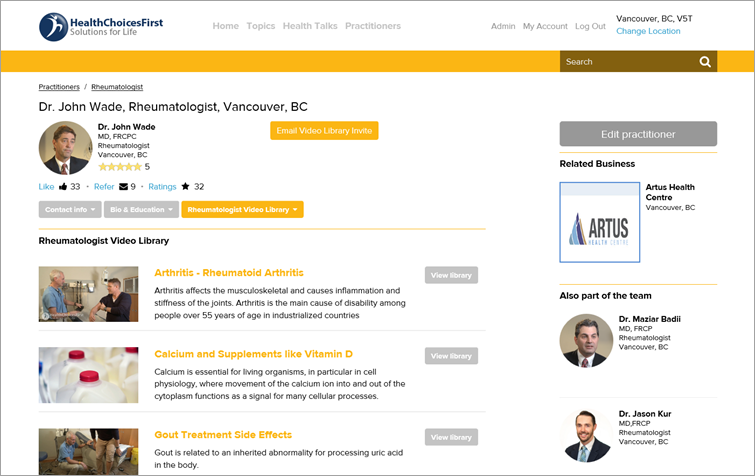 You can invite your patients to view your library with an easy to use email feature on your practitioner page. This page is only accessible through this link: This message may contain confidential information that is legally privileged, and is intended only for the use of the parties to whom it is addressed. If you are neither the intended recipient or the employee or agent of the intended recipient responsible for the delivery of this information, you are hereby notified that the disclosure, copying, use or distribution of this information is strictly prohibited. If you have received this transmission in error, please notify me immediately by telephone at 604.230.0735 or by e-mail. Thank you.